Eugene Onegin, Op. 24, Act I, Scene 1: No. 1, Duet and Quartet "Slykhali l' vy?" Eugene Onegin, Op. 24, Act I, Scene 1: No. 2a, Chorus and Peasants' Dance "Bolyat moi skory nozhen'ki"
Eugene Onegin, Op. 24, Act I, Scene 1: No. 2b, "Zdravstvuy, matushka-barynya"
Eugene Onegin, Op. 24, Act I, Scene 1: No. 2c, Choir "Uzh kak po mostu-mostochku"
Eugene Onegin, Op. 24, Act I, Scene 1: No. 3a, Scene "Kak ya lyublyu pod zvuki pesen"
Eugene Onegin, Op. 24, Act I, Scene 1: No. 3b, Olga's Arioso "Ya ne sposobna k grusti tomnoy"
Eugene Onegin, Op. 24, Act I, Scene 1: No. 4, Scene "Nu ty, moya vostrushka"
Eugene Onegin, Op. 24, Act I, Scene 1: No. 5a, Scene and Quartet "Mes-dames! Ya na sebya vzyal smelost'"
Eugene Onegin, Op. 24, Act I, Scene 1: No. 5b, Quartet "Skazhi, kotoraya Tat'yana"
Eugene Onegin, Op. 24, Act I, Scene 1: No. 6a, Lensky's Scene "Kak schastliv, kak schastliv ya"
Eugene Onegin, Op. 24, Act I, Scene 1: No. 6b, Lensky's Arioso "Ya lyublyu Vas. 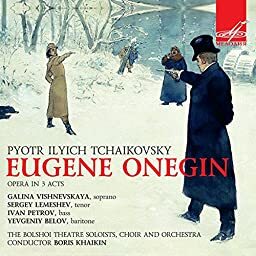 Ya lyublyu Vas, Ol'ga"
Eugene Onegin, Op. 24, Act I, Scene 2: No. 9, Tatiana's Letter Scene "Puskay pogibnu ya"
Eugene Onegin, Op. 24, Act I, Scene 2: No. 10, Scene and Duet "Ah, noch' minula, vse prosnulis'"
Eugene Onegin, Op. 24, Act I, Scene 3: No. 11, Girls' Chorus "Devitsy-krasavitsy"
Eugene Onegin, Op. 24, Act I, Scene 3: No. 12a, Scene "Zdes' on, zdes' Evgeniy"
Eugene Onegin, Op. 24, Act I, Scene 3: No. 12b, Scene "Vy mne pisali, ne otpiraytes'"
Eugene Onegin, Op. 24, Act I, Scene 3: No. 12c, Onegin's Aria "Kogda by zhizn' domashnim krugom"
Eugene Onegin, Op. 24, Act II, Scene 1: No. 14a, Scene "Uzhel' ya zasluzhil ot vas nasmeshku etu?" Eugene Onegin, Op. 24, Act II, Scene 1: No. 14b, Scene and Triquet's Couplets "Kakoy prekrasniy etot den'"
Eugene Onegin, Op. 24, Act II, Scene 1: No. 15b, Onegin "Ty ne tantsuesh', Lenskiy?" Eugene Onegin, Op. 24, Act II, Scene 1: No. 16, Final "V vashem dome!" Eugene Onegin, Op. 24, Act II, Scene 2: No. 17a, Introduction, Lensky's Scene " Nu chto zhe? Kazhetsya, protivnik"
Eugene Onegin, Op. 24, Act II, Scene 2: No. 17b, "Kuda, kuda, kuda vy udalilis?'" Eugene Onegin, Op. 24, Act II, Scene 2: No. 18a, Duel Scene "A, vot oni!" Eugene Onegin, Op. 24, Act II, Scene 2: No. 18b, Duel Scene "Vragi! Davno li drug ot druga?" Eugene Onegin, Op. 24, Act III, Scene 1: No. 20b, Scene "I zdes' mne skuchno!" Eugene Onegin, Op. 24, Act III, Scene 1: No. 20c, Scene "Knyaginya Gremina!" Eugene Onegin, Op. 24, Act III, Scene 1: No. 20d, Gremin's Aria "Lyubvi vse vozrasty pokorny"
Eugene Onegin, Op. 24, Act III, Scene 1: No. 20e, Scene "Itak, poydem, tebya predstavlyu ya"
Eugene Onegin, Op. 24, Act III, Scene 1: No. 21, Onegin's Arioso "Uzhel' ta samaya Tat'yana?" Eugene Onegin, Op. 24, Act III, Scene 2: No. 22a, Scene "O! Kak mne tyazhelo!" Eugene Onegin, Op. 24, Act III, Scene 2: No. 22b, Final Scene "Onegin, ya togda molozhe"
(C) 2011 FSUE "Firma Melodiya"